There are two different varieties of Freesia that you will see in flower at the moment, flourishing in nature strips and on the side of the road. Freesia refracta and Freesia alba X F. leichtlinii are declared weeds in the Surf Coast Shire because they spread easily and threaten to invade bushland. Freesias are perennial herbs that die back in summer and produce new foliage in winter. The leaves are flat, soft, straight and are arranged in a roughly fan shape at the base of the flower stalks. The highly fragrant trumpet-shaped flowers appearing in spring are white to cream and pink with yellow markings, shaded purple on outer surface. Flower stalks grow to about 300mm high. The numerous seeds form in wrinkled green capsules. Each plant has at least two corms, one below the other, thus requiring deep digging to remove them. The recommended approach is to firstly refrain from planting them, and if they are there, to remove them completely from your garden. Enjoy them as cut flowers and then dispose of them in the green waste collection. Cut off all of the flower stalks and dispose of them in the green waste as soon as the flowers begin to fade. If seeds are beginning to form, cut off the flower stalks and ‘cook them’ in the sun inside black plastic bags before disposing of them. Restrict the expansion of clumps of Agapanthus, Watsonia and Freesia by planting them in containers, or inserting plant guards into the ground around them. Bushy Yate is an evergreen densely rounded tree to 8m with spread of 3m. It is endemic to the south coast of Western Australia. In the past it has been a popular garden tree because it grows quickly into an effective screen tree with deep green elliptical leaves and attractive large citrus-green flowers in autumn and winter. The orange flower pods form clusters like fingers extending from a hand and the horned seed capsules are fused at the base in clusters of five to eight. Unfortunately this plant has naturalised into the Surf Coast cliffs, coastal areas and bushland where it seeds prolifically. For example, after clearing one tree beside the walking track between Anglesea and Point Roadknight volunteers removed hundreds of seedlings. Seedlings can be pulled up by hand. Larger plants will need to be cut down as close to ground level as possible and the stump sprayed with a systemic herbicide. If the plant re-sprouts, cut away the new shoots and spray each cut area with the herbicide. NZ Mirror Bush, Coprosma repens, is a large shrub or small tree to 5m high. It is easy to identify because of its glossy, deep green, rounded leaves. The small creamy-white clusters of flowers are present during summer months. The flowers are followed by orange-red berries that attract birds, particularly blackbirds, which feed on the berries and spread the seed to new areas. Mirror Bush spreads along roadsides and into reserves where it tends to grow in dense clumps, eliminating indigenous species. Kohuhu, Pittosporum tenuifolium, is a densely foliaged, evergreen tree or shrub to 8m high. The oval shaped leaves are shiny with wavy margins and a prominent mid-vein, which cluster around the stem in whorls. The perfumed reddish-purple flowers appear in clusters in spring. The sticky seeds are favoured by currawongs, silvereyes and blackbirds, which disperse seeds into new areas. Kohuhu spreads quickly into bushland reserves, forming a dense canopy and excluding light to the understorey. It is particularly invasive in damp gullies. Small plants of each of these species are easy to pull out. However if they are larger than a few centimetres it is more appropriate to remove them by digging or by cutting them down just above ground level and then poisoning. There are lots of blue flowering plants on show during the summer months, including three of the nominated weeds that grow prolifically in our region. One is Bluebell Creeper, Billardiera fusiformis. Originally from Western Australia it was a popular garden plant because it grows vigorously without careful attention. Unfortunately it is those characteristics that make the Bluebell Creeper one of the most devastating environmental weeds. Twining around other plants it quickly forms large colonies smothering any nearby plant. The bright blue flowers are bell shaped, nodding below the stalks and the bronze to burgundy seed pods hang in small clusters. The dark green leaves are smooth, oblong or lance-shaped. Another of the blue flowering plants is the Blue Periwinkle, Vinca major, or Bigleaf Periwinkle, which is an import from the western Mediterranean. It is a trailing vine that spreads in a dense mat across the ground by developing roots along the stems. Each single star shaped flower is 3-5cm in diameter and has five angular bright blue petals. The flowers are hermaphrodite (have both male and female reproductive organs) and can therefore self fertilise. For both of these weeds the management is the same. Small plants can be pulled out. Larger plants need to be either sprayed or cut down to ground level and then poisoned. And of course there is Agapanthus, Agapanthus praecox subsp. orientalis. These are dense in some gardens and nature strips, and unfortunately also growing in nearby clifftops and bushland. If you want to continue growing Agapanthus in your garden please ensure that you remove all flower heads before they set seed. The outbreak of African Weed Orchid, Disa bracteata, is a very real threat to the indigenous orchids and flora in this area. It was first recorded in Western Australia in 1944, in South Australia in 1988, and near Bacchus Marsh in Victoria in 1994. Since then it has spread across the state and multiplied, probably through soil transportation (both movement of soil and on vehicle tyres) and wind dispersal of seed. Disa bracteata is a ground orchid growing to about 30 cm tall with small yellow, green and brown flowers arranged in a dense spiral on fleshy stems. It is known from a range of disturbed woodland, heathland and grassland environments. The flat, strap-shaped leaves surrounding the base of the flower stalk grow to approx. 12-15 cm and are dull green in colour on the top and reddish-brown underneath. If you see this plant it is important to dig underneath it with a screwdriver or other long thin tool, such as a weeding fork in order to remove both its two bulbs. Dispose of the plants by sealing them in a black plastic bag and leave them to cook in the sun. On November 14 a group of 17 volunteers from ANGAIR, Friends of Eastern Otways, Alcoa, Barwon Water and Parks Victoria weeded a very small area on Coalmine Road. In less than two hours they removed an estimated 5800 plants. Many were in full flower, while others were no more than one or two leaves with a bulb the size of a marble underneath. The site will be monitored. The volunteers had been brought together as a special-purpose group after a sighting of the orchid a few days earlier. The photograph displayed was sent by a member of ANGAIR who found it growing in their garden in Anglesea. At this time of the year it is difficult to go anywhere in the district without seeing bright displays of garden escapees such as Freesias, Ixias and Sparaxis growing on nature strips and road verges. Unfortunately they are also naturalising into our bushland. Both Ixias and Sparaxis are advertised in nursery catalogues as hardy, easy to grow, free flowering bulbs. Both are members of the family Iridaceae and are endemic to Cape Province in South Africa. Ixias (commonly known as Corn Lilies or Wand Flowers) have fine grassy foliage and tall stems of six petal flowers massed together. There is a wide range of colour in the cultivars; however the wild ones tend to be white. Sparaxis (commonly known as Harlequin Flowers) have conspicuous flowers consisting of six petals which can be any colour ranging from cream to purple and through the full colour pallet of reds and oranges. The flowers are distinctive because in almost all cases the centre of the petals is of a different colour, often bright yellow and/or dark brown-black. Because the corms of both of these species are dormant over summer the best time to dig them up or spray them is whilst they are in flower. Sweet Pittosporum is an Australian native plant indigenous to parts of Victoria, Queensland and New South Wales, but not Anglesea. Prior to European settlement, it was confined to warm temperate rainforests, lowland forests, woodlands in river valleys, and near coastal sites from the Mitchell River in Gippsland to close proximity with Western Port Bay. It has now become a widespread environmental weed in wet forests and coastal scrub of southern Victoria, largely owing to seed dispersal by birds. It is widespread throughout the Surf Coast in private gardens and it has invaded many nature reserves. Sweet Pittosporum is a tree to 15 m high. Leaves, 6–17 cm, are aromatic when crushed, oblong with wavy margins, glossy above and paler below. Flowers are creamy white, and clustered in umbrella like inflorescences in spring. The fruit is a globular capsule containing numerous seeds, and which matures to an attractive, orange-brown colour when ripe. This environmental weed is a serious threat to our local flora, as seed is easily transferred by birds from private gardens, or from nature reserves that have been previously invaded by the weed. It forms dense canopies, excluding light from the understorey, and soon out competes the local indigenous vegetation. Young plants, up to 1 m, can be hand pulled. Larger plants need to be cut down and the trunk treated with a systemic herbicide. Alternate plants for the garden are Golden Wattle Acacia pycnantha and Moonah Melaleuca lanceolata. Reference: Environmental Weeds: Invaders of our Surf Coast 2007 edition p. 22. "An organisation, with the appropriate name of StopPitt, has emerged recently to tackle the issue of widespread invasion of Sweet Pittosporum, Pittosporum undulatum. In the 1940's there was ONE Pitto tree in the entire village of Menzies Creek, in the Dandenong Ranges. Seventy years later, there are now up to 10,000 per hectare, forming canopies under which there is no diversity. Significantly, there are no eucalyptus seedlings under these canopies. These observations led to a Citizen Science Project at the Menzies Creek Primary School in 2011-12, which revealed a gender ratio of 20-30% female and 70-75% male. So for effective control of this invasive weed, only the female trees (the ones with the seeds on them) need to be controlled, thereby saving millions in costs across the country. Weed Survey data from the Yarra Ranges Council showed that several Pitto invasions now surround the Dandenong Ranges, while data from Parks Victoria and Melbourne Water indicate that large areas are now covered with young populations of Pitto. These populations are consolidating and when they meet, their canopies will coalesce; the total replacement of our diverse eucalyptus ecosystem by the mono-cultural Sweet Pittosporum ecosystem is under way. The current generation of plants within our eucalyptus ecosystem, including eucalypts themselves, is their last – unless we StopPitt. Sweet Pittosporum has now developed into a serious invasive weed tree. It evolved in the SE region of Queensland and subsequently migrated down the cool valleys along our east coast to Gippsland; it then appears to have developed a more invasive form as it moved further west. This invasive form has been distributed by the Nursery industry to Tasmania and across Victoria, to the Adelaide Hills of SA, and as far west as Margaret River in WA. It has reached Mauritius, South Africa, South America and the USA. In Jamaica, it has claimed the Central Blue Mountain Range, while in The Azores, it covers 60% of its territory. It has now reached Portugal, so it's on its way to China . . .
We do need to StopPitt! Pull them out! Cut them down! Google STOPPITT." Many attractive trees have been planted in domestic gardens as well as in roadside and cliff-top plantings in the Surf Coast area. These include native trees such as Silky Hakea Hakea sericea, Sweet Hakea Hakea drupacra, Pincushion Hakea Hakea laurina, Bushy Yate Eucalyptus lehmanni, Sugar Gums Eucalyptus cladocalyx, Sallow Wattle Acacia elata and Flinders Range Wattle Acacia iteaphylla. Unfortunately conditions in this region have made it possible for these trees (and others) to naturalise into nearby indigenous reserves. Asparagus Fern Asparagus scandens and Bridal Creeper Asparagus asparagoides, were planted extensively in the sand dunes because they form a tight mat of roots preventing erosion. However, that characteristic is the reason that they are now declared weeds as their root mass is so dense it prevents indigenous plants from taking root. Many Australian natives are declared weeds of the Surf Coast Shire. Coast Teatree, Leptospermum laevigatum, is one of these. Of the 83 recognised Leptospermum species growing in Australia, four species only are indigenous to the local area. There is however, one species native to other areas of eastern Australia that has frequently been used in amenities plantings and coastal plantings because it is salt- resistant and very hardy. It has been declared a weed because it grows vigorously and threatens to overcome areas occupied by indigenous species. Leptospermum laevigatum (Coast Teatree), is a woody shrub or small tree with grey-green leaves that are generally oval-shaped 15-30 mm long by 5-8 mmm wide. The white, five-petalled flowers are fairly typical of the genus, being circular (up to 20 mm diameter) with numerous small stamens surrounding the central stigma. Flowers are followed by small, woody fruits containing many seeds; the fruits remain unopened until they are removed from the plant or the plant dies. Because Leptospermum retain their woody seeds it is difficult to prevent them being eaten by birds and then being distributed throughout the district. The recommended approach to all of these plants is therefore to firstly refrain from planting them, and if they are there, remove them completely from your garden. The Surf Coast Shire publishes an Indigenous Planting Guide which is freely available, suggesting like species to plant. Many Australian natives are declared weeds of the Surf Coast Shire. Some of these were actually planted on roadsides or public area before it was realised how quickly they could spread into the bushland to cause problems for indigenous flora and fauna. Others have been planted in domestic gardens and are still being promoted in nurseries because they are reliable, drought resistant and easy to grow. Three important groups (genera) from the Myrtaceae family are Melaleuca, Eucalyptus, and Leptospermum. Declared weed species from these genera will be addressed successively in coming months. Bracelet Honey Myrtle Melaleuca armillaris is a native of SA and Vic. It has rough, grey fibrous bark, distinctive branching and dense foliage. The narrow, pine-like leaves are arranged in alternating pairs at right angles to the pairs above and below. The bottle-brush flowers are usually white-cream. Green Honey Myrtle Melaleuca diosmifolia is endemic to WA and has become naturalised in Victoria. A dense shrub sometimes growing to a height of 4 m with narrow oval or elliptical shaped leaves arranged alternately directly onto the stem. The bottle-brush flowers are lime-green. Mauve Honey Myrtle Melaleuca nesophila is endemic to a small area near Albany in WA. It grows into a large shrub or small tree up to 5 m in height and width. It has greyish-white, papery bark and a dense crown. Its flat elliptical leaves with rounded ends are arranged alternately. The lavender-pink pom-pom shaped flowers appear at the end of stems. Red Honey Myrtle Melaleuca hypericifolia is endemic to NSW and is a large woody shrub or small tree with greyish papery bark. Its narrow, elliptic leaves, with a central groove on the upper surface, are arranged in alternate pairs. The red-orange flowers in loose bottle-brush form are usually on old wood. Because Melaleuca retain their wooden seeds on old wood for many years, it is difficult to prevent them being eaten by birds and distributed throughout the district. The recommended approach to all of these plants is therefore to firstly refrain from planting them, and if they are there, remove them completely from your garden. Many declared weeds of the Surf Coast Shire have their origins in domestic gardens. Several of these plants are still promoted in nurseries because they are reliable, drought resistant and easy to grow. Unfortunately it is just these characteristics that enable such plants to spread into the natural bushland to the detriment of native flora and fauna. Five examples of garden escapees, all of which originated in South Africa are: Agapanthus (African Lily), Agapanthus praecox ssp. Orientalis; Gazania, Gazania linearis; Wild Watsonia, Watsonia meriana ‘Bulbillifera’; Myrtle-leaf Milkwort, Polygala myrtifolia var myrtifolia and Freesia Freesia refracta. The recommended approach to all of these plants is to firstly refrain from planting them, and if they are there, remove them completely from your garden. Enjoy them as cut flowers and then dispose of them in the green waste bin. Cut off all the flower heads and dispose of them in the green waste bin as soon as the flowers begin to fade. If seeds are beginning to form, cut off the flower heads and “cook” them in the sun inside black plastic bags before disposing of them. There are two forms of Broom that have been declared environmental weeds in the Surf Coast Shire and are also Weeds of National Significance. They both come from Europe and flourish in the local climate. Both have yellow pea-like flowers in clusters at the ends of their branches in late winter and spring. Cape Broom or Montpellier Broom, Genista monspessulana has stems that are ribbed and covered with short hairs. The leaves are formed in three leaflets that are broadly oval, dark green on top and paler underneath. The seedpods are flat brown-black pods that are densely covered with hairs. The stems of the Flax-leaf Broom Genista linifolia are also ribbed and somewhat hairy. The young stems are green whilst the older wood is grey-brown. The leaves are formed by three narrow leaflets, dark green above and silvery below, with the margins rolled under. The seedpods are downy, becoming grey-black as they mature. Both of these forms are highly invasive, particularly in disturbed ground where they can form dense stands up to 3m high. They increase bushfire fuel load and can create harbour for rabbits and other vermin. They are also prolific seeders and the seeds can remain fertile for many years. Control: Small plants can be pulled out or dug up. If this is not possible then spraying the foliage with a herbicide can be effective. If the plants are too big to be eradicated by these methods then cut the plant close to the ground and immediately paint herbicide on the cut surface. If the plant is beginning to set seeds, cut off the tips of the branches bearing the seedpods, place them in a black plastic bag, tie the bag securely, and allow the bag to sit in the sun throughout the hot months. Spanish Heath is native to southern France, northern Spain and Portugal, and was originally introduced into Australia as an ornamental plant. It has escaped from cultivation, and is now quite widespread along the roadside and coastal reserves in our area, where it has demonstrated the capacity to displace a large number of our smaller indigenous plants. Spanish Heath is a member of the heath family, and is closely allied to the Australian heath family, Epacridaceae, which includes our common heath Epacris impressa. The invader is a small to medium-sized shrub, with many branching stems. The leaves are fine, crowded and dark green, while the bell shaped flowers are white, sometimes tinged with pink. Fire contributes to its spread, and suckering appears to be a major means of spreading in some areas. Early treatment is the best method of eradication, as small plants can be pulled out quite easily when the soil is moist. Medium sized plants should be dug out, while larger plants will require cutting and administration with an appropriate herbicide. This indigenous Western Australian plant is considered a weed in Victoria and other eastern states. It is a quick-growing, dense, large shrub or small tree to 4 m high with narrow elliptical leaves to 15 cm. The Pincushion Hakea flowers during autumn and winter, producing deep pink-red, round, pincushion flowers with cream ‘pins’. Hakea species tend to rapidly invade the environment, especially in coastal situations. The fire sensitive shrubs sprout and regenerate prolifically after burning. Control seedlings by pulling them by hand. Kill larger plants by cutting the stems as close to the ground level as possible. Should re-sprouting occur, treat the stumps with a systemic herbicide. A new major threat has arrived on the Surf Coast in the last three years; originating in South Africa, it is called the African Weed Orchid. It is a perennial, terrestrial orchid, with underground tubers. Dormant for much of the year, this weed orchid sprouts in early spring, as a basal rosette of narrow leaves, and takes a minimum of three years from seed to the flowering stage. The underside of the leaf has a rich purple-red marking. It is an erect orchid 30–50 cm tall, with up to 50 dense flowers, arranged in an indistinct spiral, the flowers mostly pinkish-brown with a yellow tongue like labellum, and with a leafy bract. It flowers from late October through to December in Victoria. The species is self-pollinating, and produces a large amount of dust like seed per plant (tens of thousands of air blown seeds). The seed matures in late November, and may be blown many kilometres, and can remain viable for seven years. The plant can also grow in many different habitats, and is not fussy about soil types. It could be defined as a weed from hell. First found naturalised near Albany, WA in 1944, it is believed to have escaped from South Australian orchid enthusiasts’ gardens in in 1988. The first infestation recorded in Victoria was near Bacchus Marsh, in 1991. In 2012, a local resident of the Surf Coast Shire found the orchid adjacent to Fraser Avenue, Anglesea, and informed Margaret MacDonald, who identified it as African Weed Orchid. In 2013 it has been found in the Painkalac Creek valley, near Hurst Rd, Point Addis, and along some roadsides in the shire. The weed is likely to be introduced accidentally on vehicles and machinery due to poor hygiene practices, spread by seeds on clothing, shoes and camping equipment, and by wind dispersal. Manual removal of the weed before it sets seed in late November is the preferred method of control. A lot of care is needed if a plant is removed as the flower head matures. Use a trowel to lever up the tubers. Gently bend the stem into a plastic bag, ensuring all seeds are deposited in the bag. Place the plastic bag in the sun to cook for a week, and dispose of it with the hard rubbish. Another alternative is to burn the tuber. How do you tell the difference between Sallow Wattle and Coast Wattle? For ANGAIR’s merry band of committed weeders, this is an important question, because Coast Wattle is indigenous to the sand dunes on the Surf Coast, and hence is protected, whereas Sallow Wattle is an invasive weed, although it is indigenous to East Gippsland and New South Wales. Both plants are erect shrubs or small trees, and are very similar, and can hybridize together, making it identification even more difficult, so we need to focus on their differences to tell them apart. The shape of the leaf or phyllode is very important in identification. The phyllodes of Sallow Wattle are linear, 5–20 cm long and 0.5–1.5cm wide s well as being quite thin and pliable. The phyllodes of Coast Wattle are much thicker, even leathery, shorter and wider 5–12 cm long, 1–3 cm wide, and narrowly elliptic in shape; the Also, the seed pods of Sallow Wattle ; those of Coast Wattle are commonly coiled or contorted. To check the differences between the varieties, investigate some of the wattles on the sand dunes, which are likely to be Coast Wattle, and compare them with Sallow Wattle, probably growing close to your residence. Sallow Wattle is arguably the worst environmental weed along the Surf Coast. It is in plague proportions in Anglesea and Aireys Inlet, and along the Great Ocean Road. At our working bees, Sallow Wattle is normally the most prolific weed we encounter. It is spreading rapidly along Victoria’s coast, and into the Great Otway National Park, smothering and destroying indigenous vegetation. Seed is spread by birds, and frequent control burns around Anglesea and Aireys Inlet have also helped its spread. Sallow Wattle can fix nitrogen and so increase soil fertility, which may affect the growth of indigenous plants that prefer low fertility soils. Seed production from Sallow Wattle is very prolific, with several hundred seeds per square metre of soil, and the seeds remain viable for up to a decade. Coast Wattle can also be highly invasive in heathlands, so it is only protected on sand dunes. Control infestations by pulling out seedlings by hand, or cutting trunks near ground level and painting the stumps with a systemic herbicide. Reference: MacDonald Margaret (Ed) 2007 reprint, Environmental Weeds, Invaders of our Surf Coast, page 9, Surf Coast Shire / ANGAIR Inc.
ANGAIR members Roger Ganly, Margaret MacDonald and Janet Stephens, have recently started a collaborative project with the Surf Coast Shire, and Conservation and Management students from Gordon Institute of TAFE, Geelong, to tackle an outbreak of Bluebell Creeper in Aireys Inlet. The aim of the project is to remove Bluebell Creeper from an area of Aireys Inlet where Pterostylis revoluta Autumn Greenhood and Diuris sulphurea Tiger Orchid grow. Leane Rolfe, from the Surf Coast Shire, has obtained permission from a number of private landholders, which will allow private properties to be weeded, together with a reserve adjacent to the Great Ocean Road. The Australian Native plant, Bluebell Creeper, is indigenous to south-west Western Australia, but is naturalised in Victoria, South Australia and Tasmania, because of to its popularity as a garden plant. It is still freely available from nurseries in Victoria, as it is not listed as a Noxious Weed by the Victorian Government. As I have mentioned repeatedly in these columns, Victorian Noxious Weed Legislation is very deficient for nature conservation. New South Wales is currently modernising their state’s approach to weeds, pests and feral animals, through their new biosecurity framework. It will be interesting to see if stronger, simplified powers will improve action against damaging weeds and feral animals in NSW. Bluebell Creeper grows as a dense, tangled shrub to 2 m high, or as twining climber of 3–5 m. It bears distinctive and attractive, blue, bell-shaped flowers, which usually hang down from spring to summer. After flowering, the plant produces blue-green, sausage-shaped berries that darken as they ripen. Since the berries are such a popular food for birds and animals, the seed in their droppings are scattered far and wide. As the plants mature, large colonies, many metres wide, are formed, smothering and strangling our indigenous vegetation. It is a very hardy plant, tolerating shade, full sun and extended dry periods. We would like everyone to make a determined effort to get rid of this plant from their garden and their road reserve, and convince their neighbours to do likewise. Small plants can be pulled out by hand, if you are careful to remove the surface roots. Larger plants need to be dug out, or the stems cut and painted with a systemic herbicide. Reference: MacDonald Margaret (Ed) 2007 reprint, Environmental Weeds, Invaders of our Surf Coast, page 42, Surf Coast Shire / ANGAIR Inc. Recently, as part of a Weeds of National Significance (WONS) initiative, an Asparagus weeds Management Manual, and associated posters, have been published. There are seven species of Asparagus Weed, which are recognized as WONS. Along the Surf Coast, including the Otways: Common Bridal Creeper (Asparagus asparagoides) pictured above, and Asparagus Fern (A. scandens) are common. During Easter, I noticed that this year’s new growth has started on Common Bridal Creeper. Climbing Asparagus Fern (A. plumosus) has also been found in the Otways. Western Cape Bridal Creeper (A. asparagoides Western Cape form) has been found in South-West Victoria, near the South Australian border. We need to be very vigilant to ensure it does not invade the Surf Coast, as the Western Cape form is potentially more damaging than the Common Bridal Creeper. The Western Cape form has darker green, leathery, waxy leaves compared to Common Bridal Creeper. Also the underground tubers of the western form are much larger. Introduced from southern Africa in the mid 1800’s, asparagus weeds were especially popular as hanging baskets and garden plants. They have escaped from gardens to become major weeds. The fleshy fruits of asparagus weed are spread extensively by birds and other animals. Difficult to control, asparagus weeds grow quickly and produce dense vigorous thickets of foliage that smother native herbs and shrubs. Below the ground, asparagus weeds produce impenetrable root mats of tubers, which persist year round and prevent the growth of native seedlings. The above ground foliage may be annual or perennial depending on the species or climate conditions. Isolated plants are controlled by digging out rhizomes, and all the tuberous roots. Larger infestations can be sprayed with a systemic herbicide. Biological control of Common Bridal Creeper, using a rust fungus, has been successful. In good years it can stop plants flowering and fruiting. Common Pampas Grass originates from South America, and it is highly invasive along the Surf Coast. Recently, I have noticed a number of isolated plants growing along the road reserves in the Shire. The green leaves are long narrow straps, 1.8 m x 2 cm, with rough, serrated edges, usually arching, but with most leaf tips not touching the ground. Flowering stems are erect, 2–6 m high, normally less than twice the height of the lower foliage. It flowers in a dense panicle 25–100 cm long, white to yellowish in appearance, from January to March. Plants in Victoria are either female or bisexual. Common Pampas Grass can form dense stands that will exclude ground flora and prevent the germination of larger trees and shrubs. Underground roots extend to 4 m radially and to 3.5 m deep. Individual flower heads contain up to 100,000 seeds with viability exceeding 75%. Wind disperses seed for several kilometres, so it is important to remove any plants that germinate. Smaller plants can be dug out. Larger plants can be treated with a non-selective herbicide. First cut all the leaves of the plant as low down to the base as possible. When the regrowth reaches about 20 cm in height, spray with a non-selective herbicide. If the plant is flowering or seeding, cut and bag the flower heads before any other treatment, or alternatively, if you are unable to spray, remove the flower heads as an interim measure. There are two other Pampas Grass species growing in Australia. Pink Pampas Grass Cortaderia jubata has invaded parts of Victoria, including the Surf Coast, and New Zealand Pampas Grass, Cortaderia richardii which is only found in Tasmania. A Rural Industries Research and Development Corporation funded project (Cousens et al 2013) has listed Sea Wheat-grass, together with Marram Grass and Sea Spurge, as the dominant invasive species along Australia’s coastal fringe, including Australia’s beaches and sand dunes. Marram Grass and Sea Spurge are common weeds along the Surf Coast, although ANGAIR routinely removes Sea Spurge between Point Roadknight and Urquhart Bluff. Marram Grass grows as a monoculture on our sand dunes along the Surf Coast, and therefore it is beyond cost effective action to control. Sea Wheat-grass grows on the terrace foredune, extending to the high water mark, at Anglesea Main Beach, and most likely at other sites on the Surf Coast. It has been introduced from the European Coasts. Sea Wheat-grass leaves are a similar colour and shape to Marram Grass, with which it blends, and its presence is not widely appreciated by ANGAIR members. However, its flower structure, which can be seen during December–January, is very different. Marram Grass flowers form a dense cylindrical upright spike 8–25cm long, while Sea Wheat-grass has a more open spike, often bending horizontally. Two major reference books on serious environmental weeds, which I routinely use, do not even list Sea Wheat-grass (Blood, 2003; Muyt, 2001). Comparison of dune profiles shows that Marram Grass forms foredunes that are typically higher, steeper and narrower than those formed by Sea Wheat-grass. The height and steepness of the seaward face means that erosion of Marram Grass dunes lead to high dune scarps that are less stable. Sea Wheat-grass is associated with low flat terraces on coasts, and when present with Marram Grass, forms a dense band closest to the sea, like at Anglesea Main Beach. The terrace containing Sea Wheat-grass that has formed at Anglesea Main Beach near the fence line, is similar to a photograph in the report showing Sea Wheat-grass on a terrace at Barwon Heads beach. Unfortunately, Marram Grass and Sea Wheat-grass were introduced as sand binders on dunes. Cousens et al (2013) report that there is very little information on the impacts of coastal weeds in Australia, and most research has been conducted on Weeds of National Significance (e.g. Boneseed). They state that decisions on coastal weed management are without adequate information, both on their impacts on ecosystems, and on the ability of the ecosystem to respond to weed removal. The authors state there is a concern that volunteers are relied upon too heavily for assistance in management, and a fear that volunteers may become burnt out. Since the Ash Wednesday fires in 1983, Coast Tea-tree has become widespread along the coastal reserve between Anglesea and Eastern View. In places it has become so widespread that, with Sallow Wattle, it is forming a barrier along the Great Ocean Road, reducing the magnificent views. There is some doubt about the exact range of Coast Tea-tree before European settlement. In Flora of Victoria (Vol. 3, page 1012), it states that Coast Tea-tree was present from near Anglesea eastward to East Gippsland. However, Torquay is normally considered as far west as it originally grew, but some publications indicate it was not present on the western side of Port Phillip Bay. Coast Tea-tree is a large shrub or small tree to 5 m tall. It has grey-green, pointy leaves, and, in spring, white, five-petalled flowers, and cup-shaped capsules. Mature trunks are often gnarled and twisted, and generally grey in colour, with peeling papery bark. Coast Tea-tree is one of the worst environmental weeds along the coastal reserve between Anglesea and Moggs Creek. It smothers our indigenous vegetation, and replaces them with a thick monoculture, and produces chemicals that actively discourage the growth of other species. This, combined with its direct competition for water, nutrients and light, allows it to dominate vegetation. It produces large quantities of seed, but it has low seed viability, that only last for one year in the soil. Mature plants do not sprout from the base after cutting. If young plants cannot be pulled out, cut the plant at the base and spray the cut trunk with a systemic herbicide. I must have pulled out about a thousand Panic Veldtgrass plants from our garden after I recently returned from a WA holiday. It is one of the most common nuisance weeds in the garden throughout Victoria. It is also found in many of our coastal and bushland reserves particularly, those that have had some soil disturbance. Annual Veldtgrass is also a serious weed in our nature reserves in Anglesea. Although Panic Veldtgrass and Annual Veldtgrass are in the same genus, their flower panicle looks very different. This is surprising, because, normally, plants of the same genus have similar looking flowers, for example Eucalypt flowers. However, each spikelet (a segment in the flower) in both species contains one bisexual floret and 2 lemmas (sterile bracts), and this feature helps put them in the same genus. Panic Veldtgrass grows to 60 cm high, and has bright green leaves, 20 cm long, and up to 1 cm wide. The spikelets, 3–4 mm long, are appressed (i.e. pressed close together) to the flowering stem, like small knobs. Plants can flower and seed within 10 weeks of germination. In sheltered sites, the grass can produce seed all year round. Annual Veldt grass, which also originates from South Africa, is widespread at the back of the sand dunes at Anglesea, near the car pullover on the Great Ocean Road below the Lookout, and also occurs at the Lookout Flora Reserve. It grows up to 1 m tall, with very distinctive purple colourings on the base of the leaves and in the flower or seed heads. The flower, or seed heads, are in a slender panicle 8–15 cm long, often with the spikelets, which are approximately 2 cm long, drooping on one side of the flowering stem. This is very distinctive and helps with identification. Both species are easy to pull out, but infestations must be monitored to prevent reseeding. Sallow Wattle is, arguably, the worst environmental weed along the Surf Coast. It is in plague proportions in Anglesea and Aireys Inlet. At our Monday morning working bees, Sallow Wattle is normally the most prolific weed we encounter. It is an erect shrub, or small tree, to 10 m high, and 10 m wide, and bears dense, yellow, cylindrical spikes in late winter and spring. The phyllodes (leaf) are 5–20 cm long, and 5–15 mm wide, and are thin and pliable. The indigenous plant, Coast Wattle Acacia longifolia var. sophorae, which grows on the sand dunes, is very similar to Sallow Wattle, and can also be very invasive of heathlands and woodlands. Since both these wattles are very common along the coast, it is a good exercise to understand the difference between the varieties. However, they do hybridize, which can make identification more difficult. The shape of the phyllode is very important in the identification. The phyllodes of Coast Wattle are thicker, shorter and wider ( 5–12 cm long and 10–30 mm wide) than Sallow Wattle. Sallow Wattle is indigenous to New South Wales and East Gippsland, however, it is spreading rapidly along Victoria’s coast, smothering indigenous vegetation. Seed is spread by birds. Frequent control burns around Anglesea and Aireys Inlet have helped its spread. Sallow Wattle can fix nitrogen, and so increase soil fertility, which may affect the growth of indigenous plants that prefer low fertility soils. Seed production from Sallow Wattle is very prolific, with several hundred seeds per square metre of soil, and the seeds remaining viable for up to a decade. The Australian native plant Bluebell Creeper has become a major environmental weed problem along the Surf Coast. Bluebell Creeper is indigenous to south-west, Western Australia but is naturalised in Victoria, South Australia and Tasmania due to its popularity as a garden plant. It is still freely available from nurseries in Victoria as it is not listed by the Victorian Government as a noxious weed. It grows as a dense tangled shrub to 2m high, or twining climber to 3-5m bearing distinctive and attractive blue shaped flowers, which usually hang down in a bell shape from spring to summer. After flowering the plant produces blue-green sausage-shaped berries that darken as they ripen. Birds including Silvereyes, Red Wattlebirds, Singing Honeyeaters and Spiny Checked Honeyeaters love feeding on the berries. Seed have been recovered from scats of Kangaroos, Brushtail Possums and Foxes. Also, Swamp Rats and Bush Rats are suspected of dispersing seed. The percentage of seed germinated is greatly increased through ingestion by birds and animals and, also, after fire disturbance. Since the berries are such a popular food for birds and animals the seeds in their droppings are scattered far and wide. As the plants mature, large colonies many metres wide are formed, smothering and strangling our indigenous vegetation. It is a very hardy plant tolerating shade, full sun and extended dry periods. We find Bluebell Creeper is very invasive at most of the reserves we help manage on our Monday morning working bees. We would like everyone to make a determined effort to get rid of this plant from their garden and their road reserve and convince their neighbours to do likewise. Small plants can be pulled out by hand if you are careful to remove the surface roots. Larger plants need to be dug out or the stems cut and painted with a systemic herbicide. Italian Buckthorn is a common environmental weed in our district, particularly invasive in the sand dunes at Point Roadknight, under the Moonah Melaleuca lanceolata. It can also be seen at Coogoorah Park and Kuarka Dorla. It often grows at the base of the Moonah trunks, where seed in bird droppings has fallen. Unfortunately, Italian Buckthorn has been cultivated as an ornamental garden shrub in private gardens, valued for its glossy evergreen leaves and red berries, which are so attractive to birds. It is native to the coasts of the Mediterranean and still available in nurseries. Italian Buckthorn is a very hardy species. 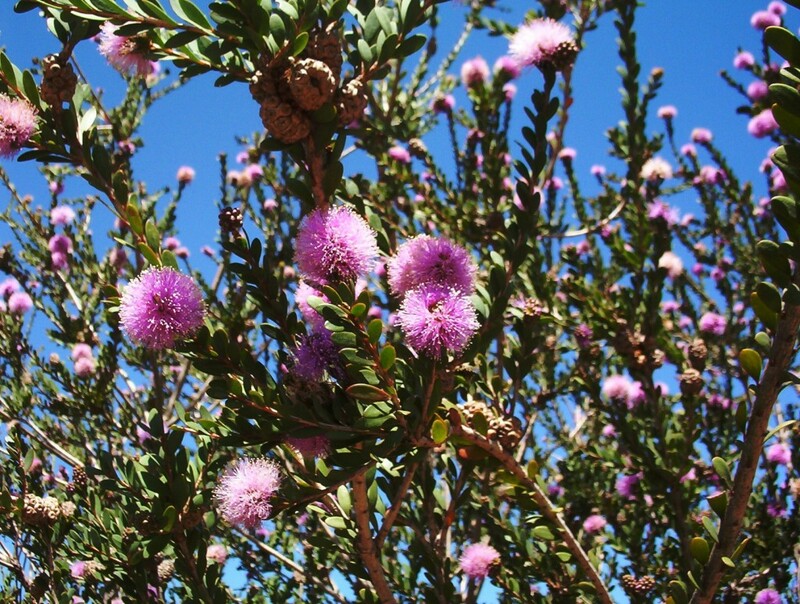 It withstands salt spray, grows in shade or full sun and tolerates droughts. It can be a large evergreen shrub 1.5m to 3m tall. However, most infestations I have seen in the district have been under a metre high. Leaves are oval, 2-6cm long and 2-4cm wide, with a shiny dark green upper surface and paler underneath. The leaf margins are shallow toothed. This is a very important identification characteristic in the bush that differentiates it from the similar leafed indigenous plant Sea Box Alyxia buxifolia that does not have toothed leaf margins. Flowers are yellow-green in small clusters in winter to early spring. Fruiting is prolific and red berries appear in summer before turning black. Seed is dispersed by birds and probably by foxes. Control can be difficult because the plant has a deep tap root that is hard to remove and it will resprout if it is broken. Larger plants can be treated using the cut and paint method, with a systemic herbicide but often they will resprout and need further treatment. Reference: MacDonald, Margaret (ed), 2007 reprint, Environmental Weeds, Invaders of our Surf Coast, page 24, Surf Coast Shire / ANGAIR Inc. I can remember growing a cutting of English Ivy from my grandmother’s garden, and planting in our new garden in the 1970’s. Soon it had covered the fence and the trunks of nearby trees and shrubs. I think I spent the next decade trying to get rid of it. English Ivy is also a serious problem in many nature reserves on the Surf Coast, including Coogoorah Park, Kuarka Dorla, Fairylands and other damp Woodland communities, particularly in shady habitats. Since it is difficult to eradicate, and new seedlings appear regularly, it has become a major environmental weed in the district. There are many different cultivars of English Ivy that have been planted in private gardens, but in the bush they revert to a wild form. In our local reserves it has formed a dense, impenetrable ground cover, and then has climbed shrubs and trees. It eliminates all competing ground cover, and prevents regeneration of the indigenous plants. It originates from Europe. Although it is well known as an environmental weed, it is still available in nurseries, markets and is swapped between gardeners. Its leaves are 4–10 cm long and have a similar width, with 3–5 lobes, often triangular, dark green and shiny on the upper surface, and lighter below. Stems of English Ivy have numerous fine roots, which allow it to climb trunks of trees, fences and walls of buildings. It flowers in late autumn and winter, with greenish yellow petals. Spherical, black-blue fruit matures over winter and into spring. Birds eat the berries and disperse the seed. Control of English Ivy is very difficult. Small plants can be hand pulled by lifting trailing stems from the outer edges, and working back. However, all stem fragments must be removed from the site, or new infestations will occur. This is why dumped garden waste is a major problem. Infestations may be sprayed with a systemic herbicide, however, the waxy leaf does not absorb herbicide very well, and spraying results are often patchy. Consequentially, outbreaks need repeated treatments over a number of years. Herbicide treatment is more successful on young growth. I have just returned from a holiday in the South Island of New Zealand, so I have seen plenty of thickets of the noxious weed Gorse, which has invaded over 1.2 million hectares in New Zealand. It forms impenetrable thickets, which exclude indigenous vegetation, and provide harbour for rabbits. We have recently treated an outbreak of Gorse at the Lookout Flora Reserve, and I have seen occasional plants along the Great Ocean Road. A very bad infestation occurs in farmland, and along the road reserve in Coombes Rd, Torquay, near the Anglesea Rd. Gorse is a very dense, spiny, evergreen shrub growing 2 m tall with a spread of 2–4 m. It has yellow pea-like flowers in clusters, mainly from July to October. Leaves are modified leaf stalks, very narrow and spine tipped. Seed is spread by explosive pods, which can flick seed to 5 m. It is critical to control outbreaks early, as the seed is still 85% viable after 25 years. Gorse tolerates most soil types, frosts, salt laden winds and drought, but not heavy shading. I found an interesting development at the Hinewai Reserve on Banks Peninsula south-east of Christchurch, New Zealand, where horticulturists are using “Gorse’s intolerance to shade” in their regeneration of the native forest. Gorse is providing protection to young rainforest seedlings, such as Beech and Podocarp trees from the harsh wintery conditions, but soon dies once it is shaded by the rainforest plants. It will be interesting in the future to see if the project is successful. I am surprised that the rainforest seedlings can penetrate the heavy Gorse thickets, but they definitely appeared to be doing so. In Australia, Gorse is a Weed of National Significance (WON), which originated from West Europe. Control of small outbreaks can be achieved using the Cut – Paint method with a systemic herbicide. Reference: MacDonald, Margaret (ed), 2007 reprint, Environmental Weeds, Invaders of our Surf Coast, page 32, Surf Coast Shire/ANGAIR Inc. It is interesting how the climatic conditions in one growing season can favour the growth of a particular environmental weed. Gladiolus species were fairly rare around Anglesea until this year. Often we would have difficulty finding a specimen for the weed stand at the wildflower show. However, this year we are seeing Gladiolus species growing in all different locations. Wild Gladiolus and Large-flower Gladiolus are perennial herbs, native to South Africa, with strappy, green leaves 8–70 cm long, and 1–2 cm wide, with corms (bulb-like, but different in structure). Wild Gladiolus has showy white to cream flowers, with a blue-green tinge, from November to January. Large-flowered Gladiolus has showy dull, yellow flowers, with dark line and veining on each petal, from September to October. Corms can produce a prolific number of cormels or bulbils (small corms) at their base. The hundreds of cormels produced by each corm are extremely tiny, allowing extensive populations to build up rapidly. The size of the cormels in these species, also provides a mechanism for medium to long distance dispersal, and for spreading into undisturbed bushland, which can be via water, soil movement, birds or human activity. The extensive rainfall this winter, which caused flooding in low-lying areas, may have helped the spread of Gladiolus species in our region. Blood (2003) has stated that both species only reproduce vegetatively in Australia via cormels, however, there seems to be conflicting information regarding the setting of seed in Australia. Because of the cormels, it is impossible to control outbreaks of either species by removing by digging. Instead, individual leaves of both species must be treated with a systemic herbicide. MacDonald, Margaret (ed), 2007 reprint, Environmental Weeds, Invaders of our Surf Coast, Surf Coast Shire/ANGAIR Inc., page 32. I have chosen two grasses as Weeds of the Month, because exotic grasses are becoming a bigger problem in the district, and are invading some of our special areas, like the Lookout Flora Reserve and Edna Bowman Flora Reserve. Both these grasses are very distinctive and therefore easily identifiable in our local reserves. Annual Veldt grass, which originates from South Africa, is widespread at the back of the sand dunes at Anglesea, near the Lookout Lay-by on the Great Ocean Road, and also at the Lookout Flora Reserve. It grows up to a 1 metre tall, with very distinctive, purple colourings on the base of the leaves, and in the flower or seed heads. The flower, or seed heads, is in a slender panicle 8–15 cm long, often with the spikelets approximately 2 cm long, drooping on one side of the flowering stem. This is very distinctive, and helps with identification. It is one of the first grasses to flower, and can reach flowering size in just eight weeks, starting flowering in September. It is also in the same genera as Panic Veldt Grass Ehrharta erecta, which is one of the most common grass weeds in Victoria, and is probably in your garden, but it does not look anything like Annual Veldt Grass. Quaking Grass originates from the Mediterranean, and is very common in the Anglesea–Aireys Inlet district, particularly at the Edna Bowman Flora Reserve, where the understorey is covered with this weed. If allowed to proliferate, it will displace orchids and herbs, and reduce species richness, as has occurred at Edna Bowman Flora Reserve. This is the major reason why we have obtained a Community for Nature Grant to try and control Quaking Grass at this reserve. The pendulous flowering structure of Large Quaking Grass is very distinctive, and it is often used in dried flower arrangements. The flowers, or seed heads, are 2.5 cm long, 1.5 cm wide, round to oval and shell like (this helps to identify the grass); initially green, the grass matures to straw colour. Quaking Grass flowers during October and November. At maturity, the flowering stems reach 20–30cm in height. Since both plants are annuals they have a poor root system, and can easily be pulled out. Other control measures include destroying seed heads by burning them with hand held gas burners, or, for Quaking Grass, burning an infested area before flowering, to eliminate standing plants and destroy seed in the leaf matter. Plants can be sprayed with either non-selective or grass-selective herbicides over autumn-winter before flower heads emerge. Reduced rates of grass selective herbicides are very effective on Large Quaking Grass seedlings at the 3–5 leaf stage. Reference: Adam Muyt 2001, Bush Invaders of South East Australia, Primary Industries, Agriculture, Sydney: pp. 54-55 and pp. 68-69. The reference is available in the ANGAIR library. Recently we found a major outbreak of Asparagus Fern in Kuarka Dorla, and although eight of us worked on the infestation at a July working bee, we did not complete its removal. There are a number of weedy species in the Asparagus genera. In Victoria, Asparagus scandens is the dominant weedy Asparagus Fern. However in Sydney Asparagus aethiopicus (also called Asparagus Fern) and Climbing Asparagus Fern Asparagus plumosus are major weeds. Bridal Creeper Asparagus asparagoides is another weedy Asparagus species that is much more prevalent around Anglesea, and is a major problem on Main Beach sand dunes at Anglesea. The foliage of A. scandens has a fern-like appearance, with very narrow leaves about 15 mm long by 1 mm wide. Asparagus is in the Liliaceae family, and has white-pink, six petalled flowers from August to October, with globular, orange to red berries when ripe. The male and female flowers are on separate plants. It is a climber, with stems 2–3 m, from a perennial rhizome. Most of the plants biomass is in underground tubers, which form a vigorous, dense mat from the short, branching rhizomes. A. scandens prefers moister sites, and is more tolerant of shade than Bridal Creeper. The extensive root mat smothers indigenous plants, and makes it impossible for seeds of indigenous plants to germinate. Asparagus Fern is spread mainly by birds, particularly blackbirds, eating their berries. It is often sold to gardeners at markets and fetes. Small infestations can be dug out when the soils are moist; otherwise rhizomes are likely to fragment. Carefully excavate around and under the rhizome, and then lever it out using hand tools. Large rhizomes can be treated using the Drill-Fill method. Use a sharp knife to scour the surface of the rhizome, and immediately paint or spray the cuts with a systemic herbicide. Like many wildflower enthusiasts, I became interested in Australia’s flora after developing the garden in our new house in the 1970’s. One of the plants that caught my eye was the Flinders Ranges Wattle, with its distinctive, silver-grey foliage growing in clay soils, north west of Melbourne. Flinders Ranges Wattle is a tall shrub up to 4 m high , and 6 m wide. Its phyllodes (leaflets) are narrow, 10 cm long and 0.5 cm wide, and growing on sand in Anglesea, the foliage is grey-green, not silver-grey. Between May and August, this wattle has ball flowers in clusters from the phyllode axils, and the grey-green pods are also attractive. It is similar to the indigenous plant Sweet Wattle Acacia suaveolens, which , common in our district, grows to 1.5 m, except that the Flinders Ranges Wattle is larger and bushier. (See Flora of Victoria Vol 3, page 642, in our Library). If you travel around the Anglesea township at this time of the year, when Flinders Ranges Wattle is flowering, you can see that it is reasonably popular in private gardens. However, we have not, until recently, seen it as an environmental weed growing in our district. The discovery of a major population of the wattle, which has invaded a hillside south of Coal Mine Rd, east of the roundabout with Camp Rd, has changed all that. At the beginning of June, the whole hillside was ablaze with flowers of Flinders Ranges Wattle. Neil Tucker has found a few young plants along Forest Rd, and along the Great Ocean Rd near the Scout Camp. Flinders Ranges Wattle is not listed as an environmental weed in the pamphlet “Environmental Weeds: Invaders of our Surf Coast”, or in reference books on weeds in our library, by Kate Blood or Adam Muyt. However it is listed as an environmental weed in the seminal chapter in Volume 1 of Flora of Victoria by Geoff Carr and in Richardson’s Weeds of the South-East, which are both available in our library. Flinders Ranges Wattle originates in South Australia, in the southern Flinders Ranges round Quorn, and to the west of Port Augusta, and is very drought tolerant. To control the plant, cut the trunk close to the ground, and treat the stump with a systemic herbicide. The Varnish Wattle Acacia verniciflua would make a good replacement in the garden. Cape Wattle or Cape Leeuwin Wattle is the common name for Paraserianthes lophantha, a small tree to 5 metres high. It has creamy-yellow, bottlebrush like flowers. Although it is not a wattle, it is in Mimosaceae, the same family as wattles, and therefore closely related. It’s much dissected, feathery leaves have close similarities to some of the bipinnate Acacias such as Black Wattle A. mearnsii, and this, maybe, is the reason behind its common name. This weed is an Australian native originating from coastal areas between Fremantle and Albany in southwest Western Australia. The large seed pods are green at first, but mature to dark brown, after which they split open to reveal large black seeds, which are spread by birds, particularly, but also by water, garden mulch and contaminated soil. Seeding is prolific, with fire stimulating the growth of thousands of seedlings. This plant is an aggressive weed, and has become a major threat to our indigenous flora along the Surf Coast. It is fast growing, reaching 2–3 m in two years, and it flowers and sets seed in the second year. Single specimens in private gardens provide a seed source that is likely to spawn dense thickets on our coastal reserve. To control this weed, you can pull seedlings quite easily by hand, but you must cut the trunks of larger plants at ground level, and paint the stumps with a systemic herbicide. It is crucial that whenever you see Cape Wattle, you remove it as soon as possible, as it will cause major infestations in our coastal reserves. Suitable replacements for the garden could include Black Wattle Acacia mearnsii or Golden Wattle Acacia pycnantha, both of which should be available from local indigenous nurseries. Refer to: Environmental Weeds: Invaders of our Surf Coast-page 20, 2007 edition p. 20. New Zealand is renowned for environmental weeds, probably because of the temperate climate and the prodigious rainfall. Gorse, Pampas Grass and Radiata Pine are everywhere in the North Island, and other than biological control, I don’t think they will ever be eradicated. New Zealand has an indigenous Pampas Grass Cortaderia richardii but the environmental weed, Pampas Grass Cortaderia selloana, which originates from South America, is widespread in disturbed areas. What Australian Native plant is the worst environmental weed in the North Island of New Zealand? I did not see a range of Australian native weeds on a recent trip to the North Island. Many Australian native plants have been planted in revegetation projects in the North Island, but I did not see any of these as environmental weeds. 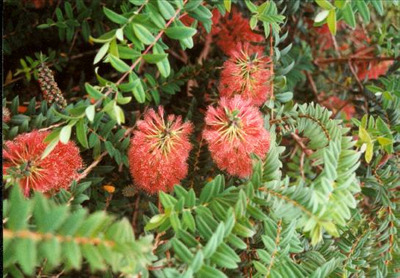 Indigenous New Zealand plants are not used in private gardens, or revegetation projects to the same extent as Australian natives in Australia. However, I was absolutely astounded by the amount of Cape Wattle Paraserianthes lophantha, which originates from the coast of Western Australia, that we encountered on our recent trip. It was mainly in disturbed areas of bush along the road reserve, but, in many places, it had invaded virgin rainforest. We saw it all along the east coast of the North Island, south of Auckland. I spoke to officers at the Botanic Gardens in Auckland, and they told me it prefers the warmer weather closer to Auckland, and struggles further south to Wellington. I wonder what will be the future extent of the invasion of Cape Wattle at Anglesea, and along the Surf Coast in the next fifty years. More plants of Cape Wattle are appearing in private gardens in Anglesea, and our native bird species will ensure they are transferred to our nature reserves, and possibly to the Great Otway National Park. In the last 2 years, a potentially devastating, new fungal plant disease has been detected in Australia. Known as Myrtle Rust, it adversely affects plants in the Myrtaceae family, which includes common Australian, native plant genera, such as Eucalypts, Callistemons, Melaleucas and Leptospermums. The disease belongs to a group of fungi known as the Guava Rust complex. First detected on the central coast of New South Wales in April 2010, Myrtle Rust has spread to many sites throughout New South Wales and Queensland, and recently was found at twenty-five sites across Victoria, which are, mainly, production nurseries and wholesale outlets in and around metropolitan Melbourne. This fungus is native to South America, and is also present in the American states of Florida and Hawaii, and in Mexico. Authorities have not yet established how this disease entered Australia. However, because rust fungus produces microscopic spores, which are easily carried by wind currents, on peoples clothing, on plants or on goods that are shipped around the world, many possibilities need to be considered. The fungus produces lesions on soft, actively growing leaves, shoot tips, young stems, flowering buds and fruit. These lesions, which have red-purple tones, develop masses of orange to yellow powdery spores. Young leaves become curled and distorted, often killing new growth. The disease is spreading locally, mainly, through infected nursery plants, and as spores on infected clothing and equipment. The rust has been found in Victoria on the indigenous plant, Lilly Pilly Acmena smithii, but, so far, garden plants are the species mainly infected. In New South Wales, evidence of Myrtle Rust has been found on a large range of Australian natives, including the genera Agonis, Callistemons, Eucalypts, Leptospermums and Melaleucas. It is difficult at this time to gauge precisely how this disease may affect our environment, as scientists and other garden experts know little about the disease and its impact, under Australian conditions, on the wide range of Myrtaceae that grow here. However, under the right conditions it may slow regeneration of the Victorian native forests after harvesting or bushfire, and even change forest biodiversity. A Myrtle Rust National Management Group was established soon after the disease was detected, and research and trials are being conducted to determine the effect of the disease on a range of species, and to understand the biology of the rust. For further Information, go to the Department of Primary Industry Website, http://www.dpi.vic.gov.au/forestry/pests-diseases-weeds/diseases/myrtle-rust or download and view this Myrtle Rust factsheet. African Box-thorn is an intricately branched, thorny shrub to 5 m. It has sharp, rigid spines, 2–15 cm, along the stems and tips of branches, and clusters of small, oval leaves 5–12 along the branches and at the bases of spines. These spines and dense branches make the bushes impenetrable, and perfect habitat for pests such as rabbits and foxes. It originated in South Africa, and was originally planted as a hedge in farmland and private gardens in Victoria in the 1800s. It grew extensively as an environmental weed on the basalt plains west of Melbourne. My 95-year-old father can remember forests of African Boxthorn growing in West Footscray in the 1920s and 1930s. When Organ Pipes National Park was gazetted in the early 1970s, African Box-thorn was one of the major weeds, harbouring a huge number of rabbits. It is an extremely tough species, growing in an amazing variety of habitats, and can withstand salt laden winds. In Anglesea, it has invaded the sand dunes at Main Beach, and still is a major problem, and we occasionally find it at other nature reserves and in private gardens. Its white flowers have lilac blotches in the centre, and bloom over spring and summer, followed by a berry, 5–12 mm diameter, which is initially green, turning to orange or red in autumn to winter. These berries contain at least 20 seeds, which are dispersed by birds, foxes and skinks, and so it is important to remove all infestations quickly before they again form mature fruit. African Box-thorn shades and crowds out other vegetation, preventing any regeneration of indigenous species. Seedlings and small plants can be hand pulled or dug out. For larger plants, cut the trunk close to the ground and treat the stump with a systemic herbicide. Refer to Environmental weeds: invaders of our Surf Coast 2nd ed. Surf Coast Shire/ANGAIR, 2007 p17. Gazania is a tufted perennial growing to 30 cm high. It has large daisy type yellow flowers, which are very distinctive and showy, while leaves are basal, linear, 5-30 cm long and 0.5- 3 cm wide, darkish green above and white tomentose beneath with the apex acute. Gazania originates from South Africa and is naturalized in USA, New Zealand, New South Wales, Victoria, Tasmania, South Australia and Western Australia. It is able to invade dry coastal vegetation, heathlands and heathy woodlands and it is found on sand dunes and along coastal cliffs. Like most environmental weeds it has escaped from private gardens. Burke’s backyard Internet site states “that if you want a plant that will laugh at the drought consider the humble Gazania”. I also saw a note from South Australia that said any prohibition on the sale of Gazania would impact on many nurseries. Many hybrids have been developed in cultivation between Gazania linearis and closely related environmental weed species Gazania rigens and this makes identification difficult. Gazania rigens has been used to stabilize sand along suburban beaches in South Australia. Gazania produces abundant wind -blown seed and spreads rapidly, withstands salt laden winds and grows well in sandy soils. Patches of Gazania are usually devoid of other species as it prevents regeneration of coastal indigenous species. Gazania is widespread in the Anglesea township along road reserves and in private gardens. It has been a pest at the bottom of the Lookout Flora Reserve and on the sand dunes near the toilets at Main Beach Anglesea, where it has been frequently sprayed with herbicide. Although it is not widespread at sites along the Surf Coast, it is important to control any plants you find on the coastal reserves as it will soon cover large areas. Control involves pulling out by hand if the infestation is small or spraying with a systemic herbicide for larger infestations. Hop Goodenia Goodenia ovata or Cut Leaf Daisy Brachycome multifida are good alternatives for your garden. This erect shrub was originally brought into Australia from the mediteranean region as a garden plant. It has escaped from cultivation, and become a very invasive, problem plant in Victoria, with only scattered outbreaks in other states. It is found throughout the Anglesea–Aireys Inlet area, and particularly at Kuarka Dorla, Anglesea Golf Club, Painkalac Creek Valley, and on the road reserve along the Great Ocean Road from the top shops at Aireys Inlet, down the hill to Bambra Rd and the bottom shops. Flax-leaf Broom is listed as a Regionally Controlled Weed under the noxious weed legislation. Plants can grow up to 3 m high, and often grow in thickets. The leaves consist of three linear and sessile leaflets with rolled edges, light green on top and silvery underneath. Yellow pea-like flowers form dense clusters in spring, at the tips of branches. At maturity the flowers fade, becoming grey to black as silky pods develop. They are prolific seed producers, with ripe seed being explosively dispersed up to 3 m from parent plants. Seed numbers in the soil can reach several thousand per square metre, and can remain dormant for at least ten years. Disturbance around infestations usually stimulates mass seed germination. The seeds are highly poisonous. Flax-leaf Broom fixes nitrogen, increasing soil nitrogen fertility, which favours invasion of other environmental weeds, and seriously affects the growth of our indigenous flora, which have difficulty tolerating high fertility soils. Thickets of Flax-leaf Broom crowd out small indigenous shrubs and ground flora, and severely impede the regeneration of larger indigenous trees and shrubs. Control measures involve pulling out seedlings by hand, or cutting the stems of larger shrubs and painting the stumps with a systemic herbicide. If you have Flax-leaf Broom in your garden, you may like to consider replacing it with Large Leaf Bush Pea Pultanea daphnoides or the Hop Goodenia Goodenia ovata. Both of these indigenous species have attractive yellow flowers, and should be available at your local indigenous nursery. Bulbil Watsonia is a highly invasive species, which has entered heathlands and heathy woodlands throughout the Surf Coast Shire. It forms dense stands, which dominate the ground layer, displacing the diverse plants of the heathland or woodland. Although Watsonia invades dry habitats, it prefers moist locations. Also, at this time of the year, you can see the salmon-pink to light red, flower spikes of Bulbil Watsonia lining many roadsides. Bulbil Watsonia grows from large, underground corms, which are up to 8 cm in diameter, enclosed in a brown fibrous material. Each of these corms produces 1–3 new corms every year. Leaves are 20–80 cm long, 4–5cm wide, sword like, rigid and green, and emerge each winter. The flowering stem, which grows in early spring, is upright, approaching 2 m in height, with 10–15 flowers, 3–4 cm apart. Flowers are 5–7 cm long, tubular, curved, orange, red or pink blooming from October to December. They rarely form seed. The primary means of reproducing new plants is the bulbils, which are small bulbs (6–7 mm in diameter) in clusters of 4–12 along the lower part of the flowering stem. These stem bulbils are dispersed by water, by machine slashing and in garden refuse. It is obvious that bulbils are dispersed along roadsides by mowing and slashing, from where the emerging plants invade the adjacent bushland. To control infestations, individual plants need to be dug out when the soil is moist, care being taken to avoid any corms or bulbils escaping. Massed plants need to be sprayed with a systemic herbicide when bulbils are forming in early spring. Grass weeds are serious threats to our nature reserves, seemingly invading them from the edges of walking tracks, where visitors have probably deposited soil, containing exotic grass seeds, from their shoes. The Lookout Flora reserve is a good example, where grass weeds, including Sweet Vernal Grass Anthoxanthum odoratum, have invaded the edges of the heathland from the walking track between Harvey St and the carpark. The Edna Bowman Flora Reserve has also been invaded by many exotic grass weeds, particularly Quaking Grass Briza maxima, and we are unsure how to control them. Two grass weeds from the same genera, Ehrharta, Panic Veldtgrass E. erecta and Annual Veldt Grass E. longifolia, are very common in the district. Panic Veldt Grass is a very common perennial garden weed to 60 cm high, most likely growing in your garden as well as extensively invading the natural environment. Large populations develop rapidly, as plants can flower and set seed any time of the year, within ten weeks of germinating. Leaves are 5–20cm long, up to 1 cm wide, mid to dark green and soft. Their flower structure is 10–40 cm long, becoming open and spreading, when mature. The spikelets that contain the flowers provide a distinguishing characteristic for this species, being very small, 3–4 mm long. Annual Veldt Grass is closely related, but looks nothing like Panic Veldt Grass, although in the same genus. It is an annual, currently starting to flower along the Anglesea to Pt Roadknight cliff top walking track near the “Pullover” Lookout on the Great Ocean Road, and on the sand dunes at Main Beach, Anglesea. Identifying it is easy to identify, as it grows to about 90 cm high, and has leaves 10–25 cm long, up to 2 cm wide, of mid to dark green colour, becoming red–purple where the sheath meets the base of the leaf blade. The flowering structure is up to 30 cm long, with flowers only on one side of the flowering stem, and drooping, which is a strong distinguishing feature, as is the red-purple on the flowering stems and in the glumes at the base of the spikelet of the flower. The flower spikelets are much larger than Panic Veldt Grass, being 1–3 cm long. The main reason that both grasses are in the same genera is the flower spikelet that contains 1 bisexual floret, which will form a seed, above two sterile florets (lemmas), but you will need a binocular stereo microscope to see this structure. We have seen, already this spring, the bright-yellow, daisy-like flowers of Boneseed blooming throughout the district. This is the ideal time, before Boneseed sets seed, to track down and remove this highly invasive weed, which is classified as a Weed of National Significance (WONS), and also, a Regionally Controlled Weed. You will see its flowers throughout the Surf Coast Shire during the next few months, so please take some action to remove any plants of this weed that you see. You can remove the smaller plants by hand pulling, as the roots are quite shallow, but you will need to cut the trunks of larger plants and treat the stump with a systemic herbicide. Boneseed originated from South Africa, and was first introduced to Victoria as a garden plant in 1858. It grows to a shrub 3 m high, with large oval leaves, often with toothed margins. Young growth is “cobwebby”. The flowers, which grow to 2.5 cm in diameter, occur in late winter and spring, and the 8 mm, spherical fruit is initially green, ripening to black. Heavy seeding, up to 50,000 per plant, ensures that the weed spreads quickly, choking out indigenous vegetation. Birds love the berries, and are the main agents of seed dispersal, excreting seed in their droppings. Boneseed is a very common and serious environmental weed in the Surf Coast Shire. Our Monday morning weeders always find seedlings, wherever we are working. Bridal Creeper is listed as one of Australia’s twenty Weeds of National Significance (WONS). Its climbing vegetation smothers indigenous plants, preventing their seed establishment. It invades predominately sandy, well-drained soils. In some areas on the eastern side of Port Phillip Bay, Bridal Creeper completely smothers all the coastal vegetation. With the onset of cooler weather and rain, the weed has started to reshoot. It is very common on the sand dunes at Anglesea Main Beach, and throughout the Surf Coast. Bridal Creeper was introduced from South Africa as a garden plant, no later than 1857, when it was first recorded in a nursery catalogue. By the 1870’s, it was a common garden plant, popular for wedding bouquets and hanging baskets, and surprisingly, it was still sold until 1997 for hanging baskets in commercial nurseries. It has spread widely from gardens to bushland, threatening indigenous vegetation throughout Australia. Bridal Creeper has an annual, climbing shoot growth to 3 m in winter and spring, from a perennial root system consisting of many tubers (food storage organs) grouped along a central rhizome. It has small, greenish-white flowers in late winter and spring, and glossy green leaves. It produces pea-sized green berries, which ripen to red, and can produce more than a one thousand berries per square metre. Birds, foxes and rabbits feed on the berries, and later excrete the seed, often in conservation reserves. Consequently, Bridal Creeper continues to infest pristine, indigenous vegetation. Digging out the plant, taking particular care to remove all the tubers, can control small outbreaks of Bridal Creeper. Spraying the foliage with a selective or non-selective herbicide during the cooler months, when growth is active, is another effective control measure. Alternative garden climbers, indigenous to our region, are Small-Leaved Clematis Clematis microphylla and the Common Apple-Berry Billardiera mutabilis. Recently, the Department of Sustainability and Environment has received funding, under the Caring for our Country Community Action Grants from the Commonwealth Government, to target two WONS Bridal Creeper and Boneseed. The aim of the project is to protect the biodiversity of 140,000 hectares of the Otways, bounded by Anglesea, Colac and Port Campbell, using a coordinated approach between agencies and community groups to control Bridal Creeper and Boneseed. Reference: Environmental Weeds: Invaders of our Surf Coast 2007 edition p. 38. Dolichos Pea, a vigorous, twining climber to 3 metres, has been widely cultivated in coastal gardens in southeastern Australia. It originates from South Africa. Clusters of pea shaped flowers, in spring and summer, vary in colour from pink, to purple and to white. Infestations smother indigenous vegetation, forming a dense cover, which is readily visible and colourful during flowering. Leaves are divided into three leaflets, 3–5 cm wide at the base, and tapering to the tip. It has narrow pods, 2–4 cm long, which explode at maturity. Hence soil disturbance around infestations is likely to cause mass germination of seedlings. Seed is also dispersed by birds. This weed has invaded the sand dunes at Main Beach, Anglesea, and is a major problem. I have recently noticed the infestation spreading into the adjoining Coastal Moonah Melaleuca lanceolata Woodland Community. Neil Tucker has noticed it along the coastal reserve at Moggs Creek also. I am not aware of other infestations along the Surf Coast. Dolichos Pea is very tolerant of harsh dry conditions and salt laden winds that occur on the sand dunes. It is also able to fix nitrogen, and hence its presence will promote other environmental weeds in the nitrogen rich soil. Young plants can be easily pulled out, but mature plants have woody thick stems and a large root system, so they are best cut and the trunk sprayed with a systemic herbicide. Sallow Wattle is a very serious environmental weed along the Surf Coast. It is in plague proportions in parts of urban Anglesea and Aireys Inlet. At our Monday morning working bees, Sallow Wattle is normally the most common weed we encounter. It is an erect shrub or small tree, to 10 m high, and 10 m wide, and bears yellow spikes in late winter and spring. The phyllodes (leaf) are 5–20 cm long and 0.5–1.5 cm wide. The shape of the phyllode is very important in the differentiating it from the closely related Coastal Wattle Acacia longifolia var. sophorae, which is an indigenous plant growing on the sand dunes. The phyllodes of Coastal Wattle are thick and 5–12 cm long and 1–3cm wide. Sallow Wattle is indigenous to New South Wales and East Gippsland, however it is spreading rapidly along Victoria’s coast, smothering indigenous vegetation. Seed is spread by birds. Frequent control burns around Anglesea and Aireys Inlet have helped its spread. Control infestations by pulling out seedlings by hand, or by cutting trunks near ground level and painting the stumps with a systemic herbicide. Refer to: Environmental Weeds: Invaders of our Surf Coast, Second Edition, page 9. This pamphlet is available in hard copy from the ANGAIR Natural History Centre, or it can be downloaded from the link at the top of this page. Coast Tea-tree is a shrub or small tree to 5 metres high, with grey-green pointy leaves and flowers that have oval, white petals, and cup shaped capsules. It is indigenous to Victoria’s coast west of Torquay, but is one of the worst environmental weeds along the coastal reserve from Anglesea to Moggs Creek. It smothers our indigenous vegetation, and replaces them with a thick monoculture. It rapidly spread from garden plantings after the Ash Wednesday Fires, and together with Sallow Wattle, is forming a barrier along the Great Ocean Road, reducing the magnificent coastal views as well as being a fire hazard. Refer to Environmental Weeds: Invaders of our Surf Coast – page 16, 2007 reprinting. Sweet Pittosporum is an Australian native plant that is indigenous to eastern Victoria, but not Anglesea. It is a widespread environmental weed throughout the Surf Coast, largely as a result of seed dispersal by birds. It is a tree to 15 metre high, with small creamy flowers with large globular capsules, which mature to an attractive orange-brown colour when ripe. Myrtle-leaf Milkwort (Polygala myrtifolia var. myrtifolia) is one of our most dreaded weeds. Major infestations have occurred all along the Surf Coast, particularly on the coastal reserve at Point Roadknight, and at the Main Beach at Anglesea. Polygala has pinkish-purple, pea like flowers, almost all the year round, but peak flowering time is late winter to spring. The short-stalked leaves are oval in shape iwth the upper and lower surfaces the same shade of green. If you go for a swim or a walk along the coastal reserve, look out for Polygala seedlings, and if you are confident with the identification, spend five minutes or so pulling any seedlings out. It is amazing what a little bit of weeding can achieve. Polygala up to a metre high are easily pulled. Reference: Environmental Weeds: Invaders of our Surf Coast 2007 edition p. 23. Bluebell Creeper is a major environmental weed problem along the Surf Coast. It is a shrubby climber, with drooping, blue, bell shaped flowers. Bachmann and Johnson have published a fascinating scientific paper describing its ecology, some outbreak observations and management implications. Below is a brief synopsis of their paper. Bluebell Creeper is indigenous to southwestern Western Australia; but it has been naturalized in Victoria, South Australia and Tasmania, where it has been commercially available for over 100 years, mainly because of its popularity as a garden plant. Bluebell Creeper is not listed by the Victorian Government as as Noxious Weed, therefore it is still freely available from nurseries in Victoria. Birds and other animals spread the seed of Bluebell Creeper. Silvereyes, Red Wattlebirds, Singing Honeyeaters and Spiny-cheeked Honeyeaters are known to eat its fruit. Seeds have been recovered from the scats of Kangaroos, Brushtail Possums and Foxes. Swamp Rats and Bush Rats, also, are suspected of dispersing seed. Seed ingestion by birds and mammals greatly increase the percentage of seed that germinate. Fire or soil disturbance can also cause thousands of seedlings to emerge, and smoke exposure is very likely to enhance germination. The authors observed "Sleeper Outbreaks" of Bluebell Creeper, where a low-density of mature plants had been present for many years, but because no fire disturbance had occurred, the indigenous plant community still appeared quite stable, retaining its structural integrity and biodiversity. Mature plants are capable of producing massive quantities of seed, which, in most part, lie dormant, hence "Sleeper Outbreak". Significantly, these sites illustrate that, given enough time, and with a large number of mature plants in a population, the background level of recruitment is still enough to result in a low-density pattern of invasion across relatively large areas of indigenous vegetation. An "Aggressive Active Outbreak" seems to occur when a fire disturbance causes a long established "Sleeper Outbreak" to realize the potential of the Bluebell Creeper seed bank. In seriously affected sites, Bluebell Creeper can reach greater than 80% cover of the understorey, thus destroying most of the indigenous herbs and shrubs. The authors observed an infestation where fire disturbance in a 10-hectare area of Rennicks State Forest near Nelson, caused the germination of tens of thousands of seedlings. Unfortunately nearby garden plantings are the likely outbreak sources, which doesn't bode well for Anglesea and Aireys Inlet, as it is common in both towns. discourange fire at "Sleeper Outbreaks", which is unlikely at Anglesea and Aireys Inlet, because of frequent `control buirns`. Purple Groundsel is a very distinctive environmental weed, which grows up to a metre tall, and bearsmagnificent, “elegant”, purple to pink, daisy flowers. Many plants have already started flowering on the sand dunes around Anglesea: behind the Main Beach east of the Surf Club, near the camping ground east of the river, and at Point Roadknight. Plants can be pulled out easily, but if they are flowering, you should bag them and dispose of them carefully, because of their prolific seeding. Refer to Environmental Weeds: Invaders of our Surf Coast – 2007, page 35. If you are confident in identifying Purple Groundsel and you see it growing along our sand dunes, pull the plants out! Cape Wattle or Cape Leeuwin Wattle is the common name for Paraserianthes lophantha, a small tree to 5 metres high, which is currently flowering throughout the Surf Coast. It has creamy-yellow, bottlebrush like flowers. Although it is not a wattle, it is in Mimosaceae, the same family as wattles, and therefore closely related. It’s much dissected, feathery leaves have close similarities to some of the bipinnate Acacias such as Black Wattle A. mearnsii, and this, maybe, is the reason behind its common name. This weed is an Australian native originating from coastal areas between Fremantle and Albany in southwest Western Australia. The large seed pods are green at first, but mature to dark brown, after which they split open to reveal large black seeds, which are spread by birds, particularly, but also by water, garden mulch and contaminated soil. Seeding is prolific, with fire stimulating the growth of thousands of seedlings. This plant is an aggressive weed, and has become a major threat to our indigenous flora along the Surf Coast. It is fast growing, reaching 2–3 m in two years, and it flowers and sets seed in the second year. Single specimens in private gardens provide a seed source that is likely to spawn dense thickets on our coastal reserve. A major infestation exists near the roundabout on the Great Ocean Rd in the Anglesea township. To control this weed, you can pull seedlings quite easily by hand, but you must cut the trunks of larger plants at ground level, and paint the stumps with a systemic herbicide. It is crucial that whenever you see Cape Wattle, you remove it as soon as possible, as it will cause major infestations in our coastal reserves. Suitable replacements for the garden could include Acacia mearnsii or Acacia pycnantha, both of which should be available from local indigenous nurseries. Refer to: Environmental Weeds: Invaders of our Surf Coast-page 20, 2007 edition. Our Monday morning weeders have already seen the bright yellow, daisy like flowers of Boneseed beginning to flower, in the middle of July, in the Painkalac Creek valley. This is the ideal time, before Boneseed sets seed, to track down and tackle this highly invasive weed, which is classified as a Weed of National Significance (WONS). In the next few months you will see it flowering throughout the Surf Coast Shire so please take some action to remove Boneseed wherever you see it. Most plants can be removed by hand pulling, as the roots are shallow. Large plants will need their trunks cut and the stump treated with a systemic herbicide. Boneseed originated from South Africa, and was first introduced to Victoria as a garden plant in 1858. It grows to a shrub 3 metres high, with large oval leaves, often with toothed margins. Young growth is cobwebby. Boneseed’s daisy like yellow flowers – 2.5 cm diameter – occur in late winter and spring, and the 8 mm spherical fruit is initially green, ripening to black. Boneseed seeds heavily up to 50,000 per plant, and spreads quickly, choking out indigenous vegetation. With the onset of cooler weather and rain Bridal Creeper has started to reshoot and is quite common on the sand dunes at Anglesea Main Beach and throughout the Surf Coast. Bridal Creeper was introduced from South Africa as a garden plant by at least 1857, when it was first recorded in a nursery catalogue, and in 1997 it was still sold for hanging baskets in commercial nurseries. Bridal Creeper is listed as one of Australia's 20 weeds of National Significance. Its climbing vegetation smothers indigenous plants and prevents their seed establishment. It invades predominately sandy, well drained soils. In some areas on the eastern side of Port Phillip Bay it completely smothers all the coastal vegetation. Bridal Creeper has annual climbing shoot growth to 3m in winter/spring from a perennial root system consisting of many tubers (food storage organs) grouped along a central rhizome. It has small greenish-white flowers in late winter and spring and glossy green leaves. Bridal Creeper produces pea-sized green berries, which ripen to red and can produce more than a 1000 berries per sqm. Birds, foxes and rabbits feed on the berries and later excrete the seed often in conservation reserves. Consequently it can infest pristine indigenous vegetation. Small outbreaks of Bridal Creeper can be controlled by digging out the plant, being very particular that all the tubers are removed. Spraying the foliage with a systemic herbicide during the cooler months when growth is active is an effective control measure. Attractive climbers indigenous to our region are Small-leaf Clematis Clematis microphylla, and the Common Apple-Berry Billardiera mutabilis. Refer to Environmental Weeds: Invaders of our Surf Coast – page 38, second edition. During the late 1920’s a number of commercial pine plantations were planted around Anglesea. These were located adjacent to Camp Road, near Mt Ingoldby and near Gilbert Street adjoining Aireys Inlet. The plantings were unsuccessful because of poor soil fertility and the plantations were severely burnt after mysterious fires (personal communication from Lindsay Braden). Unfortunately, after the plantations were disbanded many of the pines were not removed. This has caused invasion of pines into the surrounding Great Otway National Park and the Alcoa lease area. Some private properties in Anglesea and Aireys Inlet have planted pines as protection against the strong coastal winds and these also are a seed source for infestation of our natural areas. The Flora of Victoria shows three pine species naturalized along the Surf Coast. They are Radiata Pine (or Monterey Pine) native to California, Maritime Pine (or Cluster Pine) and Corsican Pine both native to the Mediterranean. These three species vary in height from 30 to 40m. Radiata Pine has slender needle like leaves in groups of three while both Maritime Pine and Corsican Pine have needle like leaves in groups of two. Radiata Pine has dark brown bark divided into deep ridges whereas Maritime Pine has reddish brown bark in plates, deeply fissured. Corsican Pine has rough greyish-brown to dark brown bark. Pines have infested many of the natural areas around Anglesea by wind-blown seed and also possibly by birds spreading the seed. We have even removed small pine trees on the coastal reserve where heathland has been restored above the Anglesea Surf Club. A number of large pine trees have also invaded the Moonah Woodland near the Art House at Anglesea where they have killed all the understorey and the surrounding Moonahs. Small seedlings should be pulled out and larger trees cut near the base and the cut trunks sprayed with a systemic herbicide. Reference: Environmental Weeds: Invaders of our Surf Coast, page 21, 2007 edition. Sweet Pittosporum is an Australian native plant indigenous to parts of Victoria, Queensland and New South Wales, but not Anglesea. Prior to European settlement, it was confined to warm temperate rainforests, lowland forests, woodlands in river valleys, and near coastal sites from the Mitchell River in Gippsland to close proximity with Western Port Bay. It has now become a widespread environmental weed in wet forests and coastal scrub of southern Victoria, largely owing to seed dispersal by birds. It is widespread throughout the Surf Coast in private gardens and it has invaded many nature reserves. This Australian native plant, which is very popular in private gardens throughout Victoria, originates on the coast in the Albany region of Western Australia, growing on granitic soils. It grows into a rounded shrub to 3 metres high, with dark green, crowded, elliptical leaves 1 cm long. It has light green, bottle brush flowers in spring and summer. Specimens of Green Honey-myrtle have been found growing in many natural areas throughout Anglesea and Aireys Inlet, but not normally in large numbers. We found it growing in the Purnell St Heathland at our Monday morning working bee in March. There is a comment in Flora of Victoria (Vol. 4, page 1002) stating that it has been found in Anglesea, but is not naturalized beyond the possibility of total removal. Seed is dispersed by wind and water, but birds may also spread the seed. To control the weed, seedlings can be pulled by hand, while larger plants must have their trunks cut at ground level, and the stump painted with systemic herbicide. If the plant has seed capsules, it is critical that the capsules are removed, otherwise a large amount of seed will be deposited at the site, and mass germination of new seedlings will occur. Rather than give garden space to this invasive environmental weed, why not replace it with Slender Velvet-bush Lasiopetalum baueri, or Hazel Pomaderris Pomaderris aspera. are easily in this period. Purple Groundsel is native to South Africa, and is common on dunes and low lying areas along the Victorian coast. When an ANGAIR working bee was removing Lotus creticus at Point Roadknight in November 2009, we found, for the first time, populations of Purple Groundsel growing nearby, and the seedlings were prolific. Also, populations were seen on the dunes at Main Beach Anglesea, at the Anglesea Coast Action January working bee. Because of its prolific seeding, it will be a very difficult plant to eradicate from our dunes, and it will readily replace the indigenous vegetation. Seed is predominately spread by wind. Plants can be easily pulled, but if they are flowering they should be bagged. If you are confident with the identification, and you see Purple Groundsel growing along our coast, pull the plants out. This free, 53pp colour book provides descriptions and methods of control of introduced plants known to cause problems in areas of natural vegetation. Essential for gardeners in the area. Click here to download a PDF copy. There are a number of publications on local fauna and flora available through ANGAIR. Click here to view a list of publications and to download an order form.